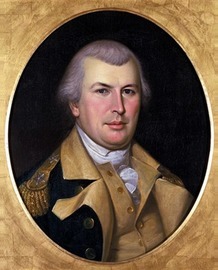 Nathanael Greene was a major general of the Continental Army in the American Revolutionary War known for his successful command in the Southern Campaign, forcing British Lieutenant General Charles Cornwallis to abandon the Carolinas and head for Virginia. When the war began, Greene was a militia private, the lowest rank possible; he emerged from the war with a reputation as George Washington's most gifted and dependable officer. Many places in the United States are named after him. He suffered financial difficulties in the post-war years and died in 1786. Greene was the son of Nathanael Greene (4 November 1707-October 1768), a Quaker farmer and smith, and he was descended from John Greene, Sr. and Samuel Gorton, both of whom were founding settlers of Warwick, Rhode Island. Nathanael was born on Forge Farm at Potowomut in the township of Warwick, Rhode Island on August 7, 1742 (new style). His mother Mary Mott was his father's second wife. His father's sect discouraged "literary accomplishments," so Greene educated himself with a special study of mathematics and law. The Rev. Ezra Stiles, later president of Yale University, was a strong influence in the young Nathanael's life. In 1770, Greene moved to Coventry, Rhode Island to take charge of the family-owned foundry, just prior to his father's death. There he was the first to urge the establishment of a public school and was chosen as a member of the Rhode Island General Assembly in the same year, to which he was re-elected in 1771, 1772, and 1775. He sympathized strongly with the Whig or Patriot element among the colonists. After only a week's encampment at Halifax Court House, Greene had sufficient promises and reports of help on the way to recross the river. Greene and the main army re-crossed the Dan River into North Carolina on the 22nd, then pursued Cornwallis and gave battle on March 15, 1781, at the Battle of Guilford Court House in North Carolina, on ground which he had chosen. Greene's army engaged Cornwallis's Army. At the height of the battle, as the Continentals started to turn the British flank, Cornwallis ordered his artillery to fire grapeshot into the thick of the battle, killing as many of his own men as Greene's. Greene ordered his army to execute a tactical retreat and left the field to Cornwallis, but inflicted a great loss of men to the British. Three days after this battle, with his army battered and exhausted, Cornwallis withdrew toward Wilmington, North Carolina. Greene's generalship and judgment were again conspicuously illustrated in the next few weeks, in which he allowed Cornwallis to march north to Virginia and himself turned swiftly to the reconquest of the inner country of South Carolina. This he achieved by the end of June, in spite of a reverse sustained at Francis Rawdon's hands at Hobkirk's Hill (2 miles north of Camden) on April 25. From May 22 - June 19, 1781, Greene led the Siege of Ninety-Six, which ended unsuccessfully. These actions helped force the British to the coast. Greene then gave his forces a six weeks rest on the High Hills of the Santee River, and on September 8, with 2,600 men, engaged the British under Lieutenant Colonel Alexander Stewart at Eutaw Springs. Americans who fell in this battle were immortalized by American author Philip Freneau in his 1781 poem "To the Memory of Brave Americans." The battle, although tactically a draw, so weakened the British that they withdrew to Charleston, where Greene pinned them down during the remaining months of the war. Greene's Southern Campaign showed remarkable strategic features. He excelled in dividing, eluding, and tiring his opponent by long marches, and in actual conflict forcing the British to pay heavily for a temporary advantage, a price that they could not afford. However, he was defeated in every pitched battle which he fought against the British during his time as southern commander. He was greatly assisted by able subordinates, including Polish engineer Tadeusz Kosciuszko, brilliant cavalry officers Henry ("Light-Horse Harry") Lee and William Washington, and partisan leaders Thomas Sumter, Andrew Pickens, Elijah Clarke, and Francis Marion. In the end, Greene and his forces liberated the southern states from British control. When the Treaty of Paris ended the war, British forces controlled a couple of southern coastal cities, but Greene controlled the rest.